Jagat Trading Enterprises Limited was incorporated as Public Limited Company under the Companies Act, 1956 on 29th September 1982 in the state of Delhi. The Company is engaged in the Business of Finance and Investments & is a Non-Banking Finance Company (NBFC) registered with Reserve Bank of India. This Code of Conduct ('Code') for the Board Members and Senior Management ensures compliance with legal requirements and helps to maintain the standards of business conduct. 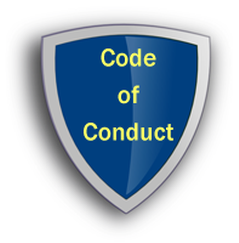 The purpose of the Code is to deter wrongdoing and promote ethical conduct. All Directors and Senior Management must act within the purview of the authority conferred upon them and with a duty to make and enact informed decisions and policies in the best interests of the Company and its shareholders /stakeholders. The Company appoints the Company Secretary as a compliance officer, who will be available to directors and senior management to answer questions and to held them comply with the Code. The following code of conduct helps the Board Members and Senior Management to maintain the high standards that the Company requires. All directors and senior management shall conduct their activities in accordance with the highest standards of personal and professional integrity, honesty and fairness. All directors and senior management will act in good faith, responsibly, competence and diligence, which are free from fraud and deception, in the best interests of the Company without indulging their personal interest. All Directors and Senior Management of the Company shall not engage in any business, relationship or activity, which might detrimentally conflict with the interest of the Company. Their duty to the Company demands that they avoid and discloses actual and apparent conflicts of interest. Directors and senior management should not engage in any business or activity that conflicts or prejudicial to the interest of the Company and which creates conflict in discharging their respective duty towards the Company. If any director or senior management officer is considering investing in customer, supplier, developer or competitor of the Company, he or she must first take care to ensure that these investments do not compromise on their responsibilities to the Company. Directors and senior management should avoid conducting Company business with a relative, or with a firm/or company in which a relative is associated in any significant role. If such related party transaction is unavoidable, it must be fully disclosed to the Board or to the Managing Director of the Company. Directors and senior management must comply with all applicable laws, rules, regulations and regulatory orders, both in letter and spirit. In order to assist the Company in promoting lawful and ethical behaviour, directors and senior management must report any possible violation of law, rules, regulation or the code of conduct to the Company Secretary. It is a conflict of interest to serve as a director of any company that competes with the Company. And therefore, all directors must report / disclose such relationships to the Board on an annual basis. The Company's confidential information is a valuable asset. Any information concerning the Company's business, its customers, suppliers etc., which is not in the public domain and to which the directors and senior management have access or possesses such information, must be considered confidential and held in confidence, unless authorised to do so and when disclosure is required as a matter of law. No director or senior management officer shall provide any information either formally or informally, to the press or any other publicity media, unless specially authorised. Directors and senior management officers shall not derive any benefit or assist others to derive any benefit from the access to and possession of information about Company, which is not in the public domain and thus constitutes insider information. All directors and senior management officers will comply with the prevention of insider trading guidelines as issued by SEBI. The assets of the Company should not be misused but employed for the purpose of conducting the business for which they are duly authorised. Directors and senior management officers must protect the Company's assets and information and may not use these for personal use, unless approved by the Board. No director and senior management shall receive, offer or make, directly or indirectly, any illegal payments, remuneration, gifts, donations or comparable benefits which are intended to or perceived to obtain business or uncompetitive favours for the conduct of its business. However, nominal gifts, which are customarily given and are of commemorative nature, for special events may be accepted and reported to the Board. Once in every year or upon revision of this Code, every director must acknowledge and execute understanding of the Code and an agreement to comply. New Directors will sign such a deed at the time when their directorship begins.